The Canadian forest can be cleared at an outlay of from £4 to £5 an acre. Not so the New Zealand, although the Company, in defiance of the knowledge we derive from facts and the state of our pockets, would persuade us to the contrary. An extract from their fifth report betrays a fear that, despite their assertions on this head, the truth will creep out. Whoever penned the following seems to have been conscious that his sincerity would be doubted ; and, fortunately, the jesuitical bias of the paragraph is so obvious that the impression it conveys is the reverse of what it was intended to do. We would ask, which of the two is more likely to give correct in-formation, the party who sells the land or the settler who has to clear it? Extract from the Company's Report. "Some discouragement has resulted to the agricultural interest of the settlement from an incautious statement in a letter from one of the principal colonists, and published in the newspapers in this country, that the forest land could not be cleared at a less cost than £40 per acre. Experience has proved that the actual cost is between £10 and £12 per acre; and it is not doubted that the work will eventually be done much cheaper. 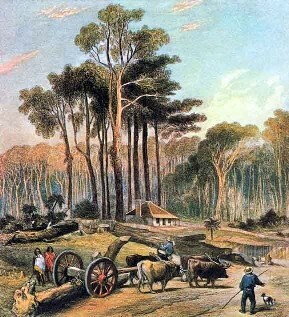 As a proof of what may be effected by energy and industry, Mr. Heaphy mentions the case of two young Scotchmen, owning a section in the Karori valley, having cleared about twenty acres of heavily-timbered land, and built themselves a house, in the space of six months, with no assistance but that of a native employed." The case cited on their draughtsman's authority stands thus. In December last we walked over the ground said to have been cleared by the Messrs. Yules ; and without quibbling about its extent, or the absence of any house upon the ground erected by the parties referred to, we shall describe its condition. The trees are certainly cut down, but the smaller branches and underwood have only been consumed. There lie the trunks, where they fell, blackened and hardened by fire, but presenting a greater hindrance to the cultivation of the soil than when they ornamented the ground they now encumber. If this be clean on, we confess we have mistaken the matter; in our opinion, and that of any one conversant with the subject, the principal operations have yet to be performed, namely, to saw the trunks into manageable lengths, and then to log and burn them. The latter, in a moist climate, is not an easy matter, and in the present case, where the small wood has already been destroyed, the difficulty is much increased. Then follows grubbing, not the roots, but what may rather be called surface branches, a very different operation in New Zealand to what it is in an American forest. We will now state one or two cases which came under our own observation. Mr. Hughie, an Irishman, assisted by some of his countrymen, cleared and stumped half an acre of forest land adjoining the Yules miscalled clearing, which cost him at the rate of Â£50 an acre. Again, a labouring man, named John Campbell, had a few days before we left Wellington contracted with a Mr. Tyser to clear and stump an acre for £20 every tree, however, above eighteen inches in diameter to be left standing ; and so fearful was this man of the speculation not answering, that he had limited his contract to one instead of five acres. These instances are in keeping with my own experience upon a town acre which was but partially wooded.